Ben Simmons grabs a pass behind the Wizards' Jeff Green during the second quarter. - The attention Ben Simmons receives while posting up creates scoring opportunities for other Sixers. During a first-quarter play, the 6-foot-10 point guard had the advantage while posting up 6-7 guard Tomas Satoransky under the basket. Seeing the mismatch, Wizards swingman Trevor Ariza left Jimmy Butler for a moment as if to double-team Simmons. That’s when Mike Muscala passed to an open Butler, who blew past Ariza, scored, and was fouled by Satoransky. - The Sixers had great ball movement. They, once again, passed up good shots for great ones. A prime example came when they swung the ball early in the game to Butler, who was standing open in the corner beyond the three-point line. But as a defender charged, the all-star swingman dumped the ball down low to Simmons for an easy dunk. - Joel Embiid has been more selective recently in taking three-point shots, and it’s paying off. The Sixers all-star center went 2-for-4 on three-pointers against the Wizards and has made 6 of 12 (50 percent) in the past four games combined. - Landry Shamet is the Sixers’ iron man. 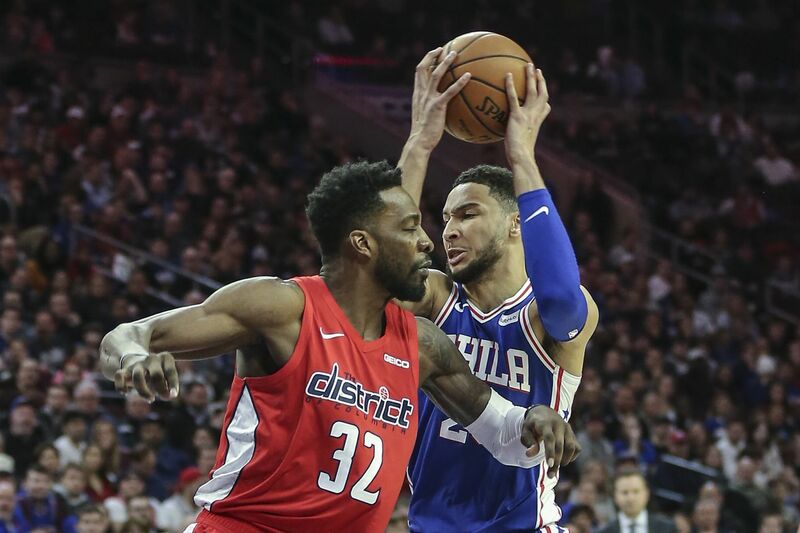 The rookie reserve guard is the only Sixer to compete in all 41 games in the first half of the season, as JJ Redick missed Tuesday’s game with lower-back tightness. As a result, it was only fitting for Shamet to finish with a game- and season-high 29 points. Best performance: This goes to Shamet for his career night. The 26th overall pick in June’s draft had career highs for three-pointers made (eight) and attempted (12). His eight three-pointers were one shy of the team record set by Dana Barros on Jan. 27, 1995. Worst performance: This was a tough one. Ariza scored two points and went 1-for-7 from the field, missing all five of his three-pointers. However, he finished with a team-high nine rebounds. So I gave this to rookie Troy Brown Jr. He had only two points and missed all four of his shots in 18 minutes, 17 seconds in a reserve role. Best defensive performance: Simmons gets this for finishing with a team-high three steals. Worst statistic: I gave this to the Sixers' 20 turnovers, No matter how good they are in other areas, the Sixers are usually careless with the ball. Best statistic: I had to give this to the Sixers' 39 assists, which set a floor record.